BMW introduced the all-new BMW X5 recently. 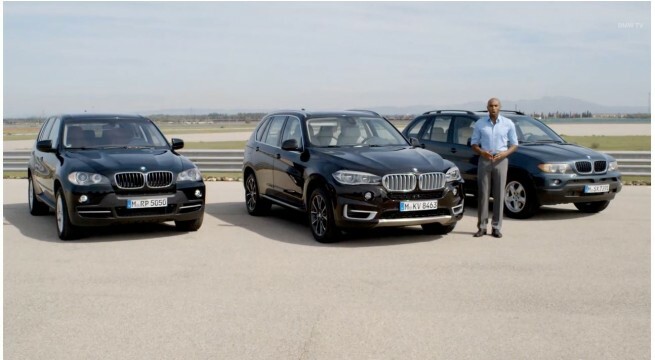 Now lets have a look at all the three BMW X5 generations at once to see the “work of progress”. Discover the progress of the exterior and interior with every single generation. The first generation of the X5, with the chassis code E53, made its debut in 1999. It was BMW’s first SUV (Sport Utility Vehicle), also known as “Four-by-Four” (4×4) in the UK, which featured 4WD all-wheel drive and was available with either manual or automatic transmission. In 2006 the second generation X5 was launched, known internally as the E70, featuring the torque-split capable xDrive all-wheel drive system mated to an automatic transmission, and in 2009 the X5 M performance variant was released as a 2010 model. BMW branded the X5 as a Sport Activity Vehicle (SAV) rather than an SUV, to emphasize its on-road ability despite its size. The third-generation F15 X5 made its debut last month and will arrive this fall at U.S. dealerships.